Introducing Pasco County & this Wonderful Home! 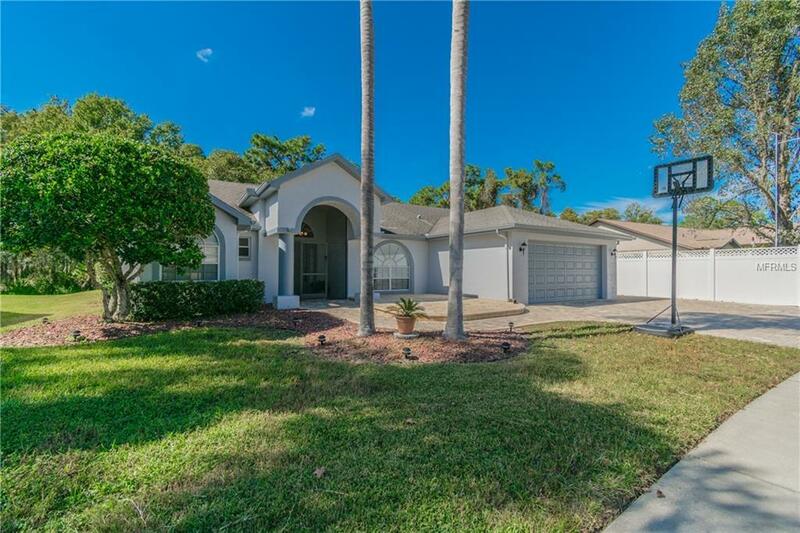 Located on the Gulf of Mexico, 30 or so miles North of Tampa, Approx 50 miles from Orlando, Pasco's location makes it easy for you to enjoy all it has to offer when you buy this home *Lower Taxes & Insurance* than Hillsborough or Pinellas Counties! Enjoy 20 miles of Shoreline, Islands, Lakes, Fishing and Diving, all Popular Sites. Write down 5147 La Plata Dr to visit! **Large Conservation .30 Acre Lot** Home is a well maintained 4 Bedroom 2.5 Bathroom with 2 Car Garage under 2249 sq feet Heated space. Features: Pavered Driveway, Split Floor Plan, Large Screened Lanai, Open Concept Living Space, Laundry Room with Mud Tub, Spacious Bedrooms, Vaulted Ceilings, Fans in all rooms, AC 2013, Outside lighting controlled via cellphone, Epoxy coated flooring in garage, LOW HOA FEE, NO CDD FEES, Pavered side parking pad, Wonderful School District, Palm trees, and more! **50yr Dimentional Shingles NEW ROOF 11/2018** The Master Retreat is HUGE with Sliders to the Lanai and a Bath that has Double Sink/Vanities, Garden Tub & Separate Shower. *Schools are Longleaf Elementary/River Ridge Middle & High* Hunters Ridge Community/New Port Richey is growing family-friendly town with dining options, shopping, Trinity Medical Center, parks & rec areas including YMCA & Jay B. Starkey Wilderness Park that offers hiking, biking plus camping. Easy access to Suncoast Parkway, Tampa Airport, MacDill AirForce Base, & famous sandy beaches. I hear my phone ringing! Priced to Sell.